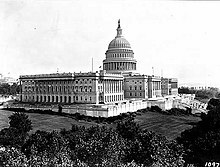 The Fifty-ninth United States Congress was a meeting of the legislative branch of the United States federal government, composed of the United States Senate and the United States House of Representatives. It met in Washington, D.C. from March 4, 1905, to March 4, 1907, during the fifth and sixth years of Theodore Roosevelt's presidency. The apportionment of seats in the House of Representatives was based on the Twelfth Census of the United States in 1900. Both chambers had a Republican majority. March 4, 1905: President Theodore Roosevelt began his second (only full) term. 1906: The Carnegie Foundation for the Advancement of Teaching chartered. At this time, Senators were elected by the state legislatures every two years, with one-third beginning new six-year terms with each Congress. Preceding the names in the list below are Senate class numbers, which indicate the cycle of their election, In this Congress, Class 2 meant their term ended with this Congress, requiring reelection in 1906; Class 3 meant their term began in the last Congress, requiring reelection in 1908; and Class 1 meant their term began in this Congress, requiring reelection in 1910. Secretary of the Senate: Charles G. Bennett of New York, elected February 1, 1900. Sergeant at Arms of the Senate: Daniel M. Ransdell of Indiana, elected February 1, 1900. The Rev. Edward E. Hale, Unitarian, elected December 14, 1903. Clerk of the House: Alexander McDowell of Pennsylvania, elected December 4, 1905. Sergeant at Arms of the House: Henry Casson of Wisconsin, elected December 4, 1905. Doorkeeper of the House: Frank B. Lyon of New York, elected December 4, 1905. Postmaster of the House: Joseph C. McElroy of Ohio, elected December 4, 1905. Chaplain: The Rev. Henry N. Couden, Universalist, elected December 4, 1905. ^ "Carnegie Foundation". Carnegie Foundation. November 26, 2011. Retrieved December 5, 2011. ^ Robert M. La Follette was elected to the 59th Congress for the term starting March 4, 1905, but he did not assume the seat until January 2, 1906, preferring to finish his term as Governor of Wisconsin. 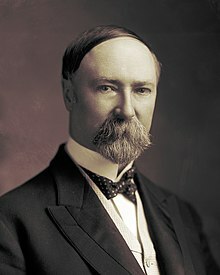 Nevertheless, his Senate service technically began March 4, 1905. Official Congressional Directory for the 59th Congress, 1st Session. Official Congressional Directory for the 59th Congress, 1st Session (1st Revision). Official Congressional Directory for the 59th Congress, 1st Session (2nd Revision). Official Congressional Directory for the 59th Congress, 2nd Session. Official Congressional Directory for the 59th Congress, 2nd Session (Revision).